Chicago, 1938. Love, murder, deceit, and revenge are in the air. Actually, they are on the air. Radio actress Vivian Witchell has finally moved beyond the secretary desk and on to the airways. 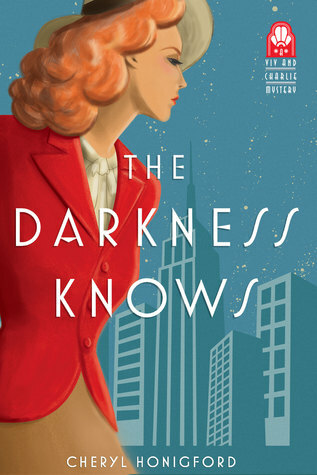 Voicing numerous small roles in a variety of radio broadcast programs, she finally has earned the coveted part of Lorna Lafferty on The Darkness Knows. Playing opposite the popular gumshoe Harvey Diamond is a dream come true and a stepping stone to even more airtime opportunities. Of course, playing opposite the dashing Graham Yarborough isn’t a bad thing either and the publicists enjoy setting up photo opportunities and hinting at a budding relationship between the two performers. Although her mother doesn’t approve the late hours and her job choice, Vivian is determined to give her career all she has, until one evening, she stumbles over the body of lead actress Marjorie Fox in the station’s lounge. Marjorie wasn’t overly well-liked by her fellow performers, but the murder threat doesn’t end with her. A note discovered with the body hints that a crazed fan stalked Marjorie’s character on the popular family drama The Golden Years and his next target is Lorna Lafferty. Station owner Mr. Hart is taking no chances with his newest star and assigns private detective Charlie Haverman to protect her. But Vivian isn’t satisfied with just being protected; she wants to find Marjorie’s killer before she is next . . . or worse, someone other actress steals her part! Shuffling through vintage radio drama, historic Chicago landmarks, back-stabbing diva performers, and personal secrets, Vivian and Charlie must learn to work together because the show must go on. This book was absolutely delightful! The mystery was fine but I most enjoyed how the author took the reader to the radio days of 1930’s Chicago. Her description of the process of producing a radio program was so detailed that the reader truly gets absorbed into the story within the story. It is obvious the author is a fan of old-time radio programs; her references to simple, classic stories that are so sterile compared to current day drama is refreshing and nostalgic. Vivian and Charlie are both likeable characters with a lot of chemistry and I look forward to their future adventures. I remember doing a radio show as part of a 4H Share-the-Fun skit. Do they still do that? The microphones set up with the actors standing around holding scripts; the sound man with a small door to slam, sandpaper blocks, and bells and whistles to create all kinds of realistic noises; the singing trio of blonde beauties belting out the jingle for the show’s commercial sponsor. One of my favorite parts of the movie Annie — the Albert Finney version not the Jamie Foxx one — is “Bert Healy’s Hour of Smiles” radio program. One thing that really impressed me about this book is that the author stated the story began as a NaNoWriMo novel. NaNoWriMo is National Novel Writing Month; during the month of November, participants work to complete a 50,000-word novel. My daughter has participated for the last few years; it is so exciting to see how an amateur writer achieved publication! I’ve been on a roll for reading books about Chicago; this is my third in a row. Although I haven’t lived there in almost two decades, it always will be home to me. Another plus is that two of my favorite authors – Victoria Thompson and Anna Lee Huber – both gave their endorsements to the novel, and that is always a win in my book! Finally, it looks like the author has plans for a second story. A short excerpt is in the back of the book but there is no date set yet for publication. This entry was posted in Book Series and tagged 1930's Chicago, Cheryl Honigford, NaNoWriMo, radio drama, The Darkness Knows, Viv and Charlie mystery on September 7, 2016 by kvgaughan.